Preheat oven to 220 degrees f and prepare baking tray with baking paper. Combine Natvia and egg whites in a bowl and beat until very stiff. Sprinkle over vinegar and cornstarch, fold in very gently with a spatula. 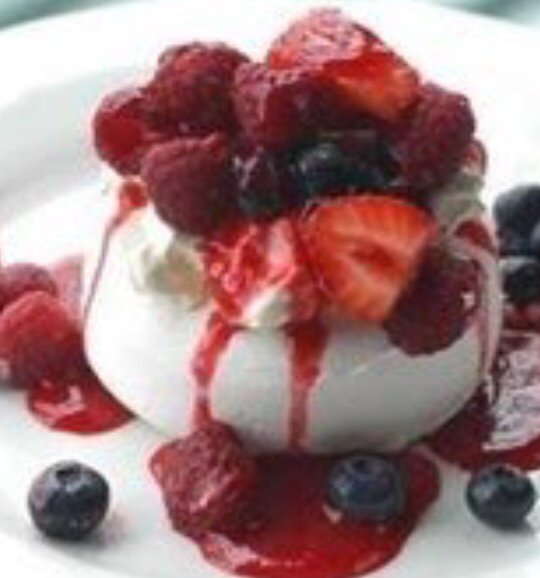 Spread meringue onto baking paper to a round the size of a small plate. Bake on the centre shelf for 30-40 minutes or until a very pale colour and firm. Turn off oven and let cool completely in the oven with door slightly ajar (about an hour). Whisk yogurt with vanilla and Natvia and spread over meringue, then top with blueberries and raspberries or any kind of citrus you like. to serve. You can also top with a lemon or orange curd then add fruit. See below various recipes on pavlova soon.